Who likes Home Depot? How about Lowes? I like these and other hardware stores. I have gone into Clements Hardware in SP and it seems like a neat store – nice people. Entering these stores boost my man confidence because there are things like hammers and hatchets, saws and screwdrivers, along with all sorts of other tools and gadgets. These are all instruments of power and control. I digress. While I like the idea of handling these objects I also have found some unintended consequences of purchasing these objects. Shopping at the hardware store implies you need to and will be fixing something. Instead of contacting a plumber, you purchase the plumbing supplies to attempt a plumbing solution. Instead of hiring an electrician, you select the sockets and wires and hope to God you remember to turn off the fuse box before you commence work. Hardware stores have made a big business teaching people how to fix problems on their own. Today, we have a lot of Home Depot kind of Christians. Nothing against Home Depot, but these are the type of people who think they do not need anyone’s help; they are their own boss, rely on their own instructions and are ultimately are their own guide and god. They might pray a prayer every now and then but for the most part they remain self-sufficient. Throughout the book of Exodus we have seen God calling His people to rely on Him rather than themselves. He created them, He saved & rescued them, He cared for and led them, He provided for them and He is their God but they continually seek to rely on their own will. God instructed Moses and the Israelites to construct a Tabernacle as a physical reminder of their spiritual dependence. In this last message of the Exodus series “Faith From Fire” we are going to see several observations about the Tabernacle and how it relates to us today. The Bible shows us God existing in perfect harmony on His own and yet creating the world with humanity so He can be among us. He plants a garden in Eden and places humanity inside it (Genesis 2:8, 15). It was good, beautiful (tob) and delightful (Eden). This was God’s design for creation. However, humanity rejected God’s presence. They rebelled and drifted away from God’s purposes. They did life their own way without God. The Lord provides grace and calls out a people unto Himself with Abraham. Onward through these generations God promises to lead them into a land filled with His presence and blessing (Genesis 12:1-2). The book of Exodus shows us that God is faithful to care for and lead His people. Even though Israel was overpowered and enslaved to the Egyptians, God rescued them. In this new land and journey God gives them His commands and instructions to build a Tabernacle. It would be a sanctuary or home for God to dwell in their midst; a mini-Eden. Around Eden flowed rivers that led to gold, bdellium and onyx stone (Gen 2:11-12). 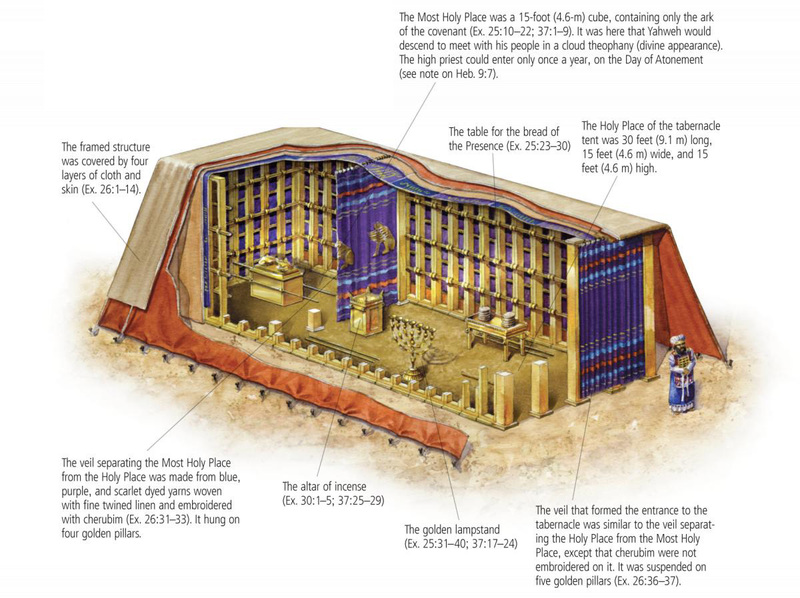 Likewise, these are materials and elements which the Tabernacle would be built (Exodus 25:3-8). Just as God created Eden with skill and significance, so God would command workers to do the same with the Tabernacle. Bezalel (name means: in the shadow of El/God) and Oholiab (name means: tent of my father) would build the Tabernacle with the supplied materials. Every piece of furniture in the Tabernacle would symbolize the nature of God. Gold symbolized God’s deity and worth; Purple symbolized God’s royal kingship, Scarlet symbolized the need for atonement or sacrifice; Oil/incense/spices symbolized fragrant worship; Lampstands symbolize light and God’s Spirit; Water in the basins would symbolize the need for cleansing of sin; and Bread on the tables symbolized God’s fellowship to eat among His people; Veils/Curtains to separate the rooms of the Tabernacle symbolized the division of flesh and Spirit; the entrance to the to the Tabernacle court faced East (Ex 27:13, 38:13) like God placed cherubim with flaming swords to guard the entrance in Eden (Gen 3:24). Inside the Most Holy Place of God’s presence would be the testimony of the Law (10 Commands) approached only after a sacrifice on the mercy seat (Ex 40:20) just as in Heaven is restored back in the center the tree of life (Revelation 22:22). The Tabernacle was a mini-Eden, with the Creator present dwelling among His people! Today, we do not need to build a Tabernacle or enter a church building to experience God’s presence. As the building was complete the fulfillment of God’s promises were coming about. God promised to bring them out of Egypt and up to a new place where He would be with them (Ex 3:7-12, 6:2-8, 25:8, 29:43-46). The Tabernacle housed the presence of God but it was not a permanent home. Israel would be on a journey following God’s presence. When the cloud of God’s glory was taken up they would travel, and when the cloud was set the people stayed. Israel thought they could keep God in a box with the ark and use Him as token but they were defeated by the Philistines who captured the ark (1Samuel 4-5). ð God is on the move. Let us not try to box in and keep Him to ourselves. Let us open the doors and windows and be SENT out to share the light and love of Christ unto the world. The Lord instructed Moses about the Tabernacle and the priestly garments WHILE the Israelites were committing idolatry (Ex 25-32). THEN, following condemning their idolatry, the Lord allowed Moses to follow through with the building of Tabernacle and the design of the garments for Aaron to wear & use as a priest. This is nothing but grace and mercy. The Tabernacle would stand as a tangible reminder to Moses, Aaron and the people of God that though they deserved judgment they received grace. – What came to Aaron’s mind when he put on the garments? Did he feel shame, humbled, forgiven, loved… YES and more! we feel undeserving but also unconditionally loved. We are reminded of 3 words: God loves me!